The biggest announcement at Reliance Industries' 41st AGM meeting today was the launch of its fixed line broadband service, JioGigaFiber. "While India has pole-vaulted into global leadership in the mobile broadband space, we still lag significantly behind in fixed line broadband. India is ranked quite low, at 134th spot in global rankings," said the company's Chairman and Managing Director Mukesh Ambani, adding that "Jio is determined to move India to be among the Top 5" in this space in the coming years. According to him, optical fibre-based fixed line broadband is the future and the company has already invested over Rs 250,000 crores for creating state-of-the-art digital infrastructure to provide mobile and broadband connectivity across the country with the largest fiber footprint. "We will now extend this fiber connectivity to homes, merchants, small and medium enterprises, and large enterprises simultaneously across 1,100 cities to offer the most advanced connectivity solutions," he added. What does this mean for your home? Think mean ultra-high definition entertainment on your large screen TV, multi-party video conferencing from the comfort of your home, voice-activated virtual assistance, smart home solutions where 100s of devises like security cameras, home appliances and even light switches can be securely controlled by owners using a smartphone - even from outside the home - and more. "This will redefine 24x7 emergency help for all homes across India," added Ambani. His children, Akash and Isha, then elaborated on JioGigaFiber potential and how it will work. The first step would be to install the GigaRouter at your premises. "This will give you an ultrafast connection with gigabits per second speeds," promised Akash, adding that the router will also give you wall-to-wall high speed Wi-Fi coverage. Next, Jio will connect a second device, the GigaTV set-top box, to your large screen TV, which will allow you to watch "600 plus" channels and every other type of content possible. What more, you will be able to "tell" your Jio Remote what you want to watch, and the voice-command feature - available in multiple Indian languages - will play it immediately on your TV. "This changes the way India will watch TV," he summed up. Another interesting feature is the JioGigaTV calling, which will allow you to make video calls to every other TV powered by JioGigaFiber as well as any mobile or tablet connected to any other network. "Just imagine, every child in a JioGigaFiber home will have live access to the world's best educational content and the best teachers," said Isha, adding that "anyone with a health problem can get real-time consultations with the best doctors right at home." The icing on the cake is that the deal includes a virtual reality headset. "Gone are the days of MBPS, now it will be all about GBPS. With JioGigaFiber every Indian home will become the most connected home in the world," she added. Jio is also going to roll out "revolutionary" smart home solutions. "With some simple accessories that Jio will provide, every appliance, plug point, switch in your house will become smart," said Akash. How long will it take to set up such a smart home? "Our engineers will come in and set up JioGigaFiber and all its smart home capabilities in as short as one hour," claimed Isha. According to Ambani, "Starting this Independence Day, August 15th, you can start registering your interest for JioGigaFiber through both MyJio and Jio.com". RIL is currently running beta trials in tens of thousands of homes for the JioGigaFiber. Those interested can register through MyJio or Jio.com. 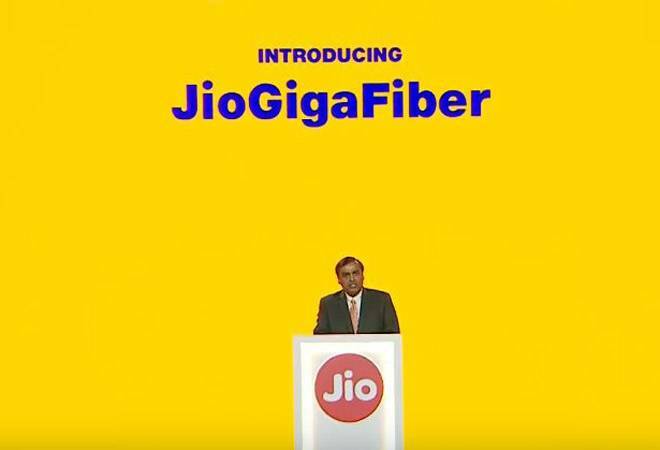 Starting August 15, you can register your interest in the JioGigaFiber. "We will prioritize our JioGigaFiber rollout to those localities from where we receive the highest number of registrations," he added. This will be the largest greenfield fixed-line broadband rollout anywhere in the world.